These buttery Strawberry Sugar Cookies have crisp edges, soft centers and – best of all! – a burst of fresh, sweet strawberry flavor. Original content posted March 2015. Updated February 2019. Although I love sugar cookies, they’ve never been on my must make recipe list as they just seem so time intensive! That is until I stumbled upon this Strawberry Sugar Cookies recipe. With just 10 minutes prep time, these cookies are in the oven. No rolling or cookie cutters involved and with a blast of strawberry flavor, too! 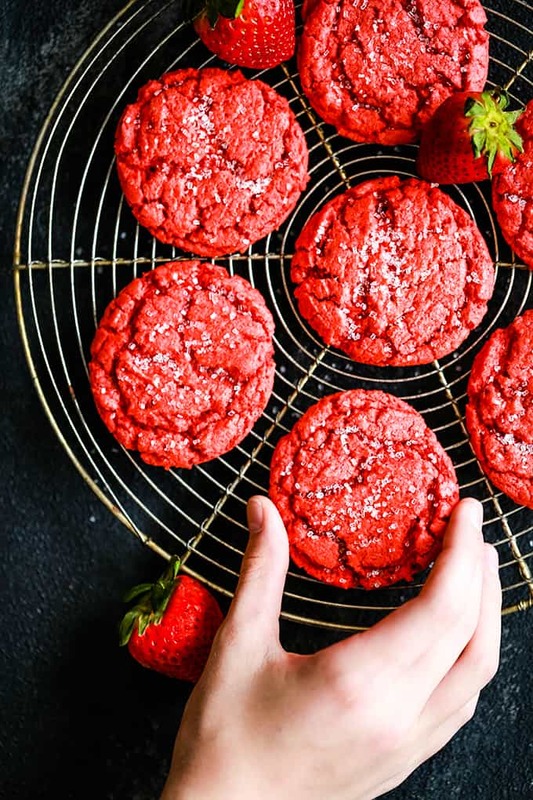 Using a shortcut ingredient, these Strawberry Sugar Cookies will bring a summery flavor to your kitchen, even if the thermometer doesn’t yet agree. It’s a simple, delicious sugar cookie recipe that yields scrumptious, buttery cookies with crinkly tops, crisp edges, soft centers and a burst of fresh, sweet strawberry flavor. 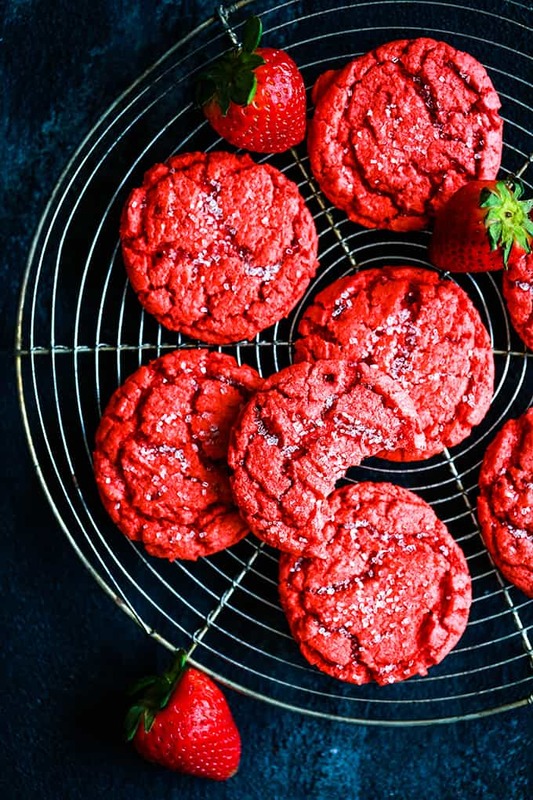 If you really want to go all out on strawberry flavor, these Strawberry Sugar Cookies would be especially delicious served alongside my Slow Cooker Strawberry Hot Chocolate. A perfect companion at a baby shower or even a Valentine’s Day party! Can You Put Strawberries in Sugar Cookies? Sadly, strawberries aren’t yet in season; but there’s another small dilemma. If you’ve ever tried to bake with fresh strawberries you’ll understand that it can be a problem, due to the high water content of the berries. Fresh strawberries tend to make cookies, cakes and breads a bit soggy, so that’s where my shortcut strawberry powder comes to the rescue! Made from freeze-dried strawberries, strawberry powder retains all of the protective nutrients of real strawberries. It’s like the most delicious, magical strawberry dust. Strawberry powder is also an excellent source of vitamin C, antioxidants, and dietary fiber. Many people love to add it to smoothies – like my Strawberry Almond Smoothie or Strawberry Grapefruit Smoothie – because of its health benefits. It’s also a key ingredient of my Strawberry Rice Krispie Treats! Here’s where I need to be honest. Although the strawberry powder definitely brings the strawberry flavor, the color that it provides is a muddy pink at best. To combat this problem, I’ve added a bit of red get food coloring to the batter. Problem solved! The end result is a true strawberry red. The final finishing touch is a sprinkle of sanding sugar that gives the cookies a glittery finish. In a large bowl, add flour, baking powder, baking soda, cream of tartar and salt. 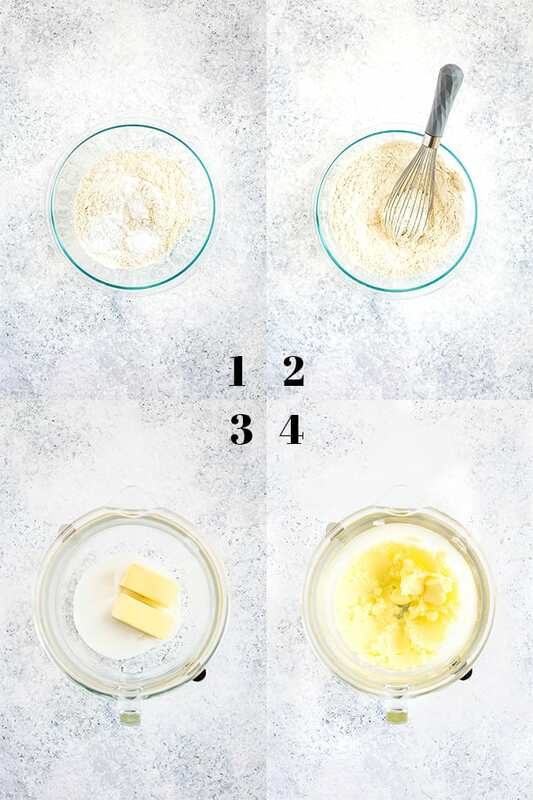 Whisk dry ingredients together to combine. Set aside. In the bowl of an electric mixer, add sugar and butter. Add eggs to mixing bowl. Mix together on low until well combined. Add dry ingredients that were whisked together previously to mixing bowl. Add strawberry powder to mixing bowl. TIP: If you aren’t able to find strawberry powder locally, I was able to purchase it online. In a pinch, you could also simply purchase a package of freeze-dried strawberries and pop them into the bowl of a food processor to pulverize them into a powder. Add red food coloring to mixing bowl. TIP: I prefer to use gel food coloring when baking as it’s a higher concentration which means you have to use less of it than you would a traditional liquid food coloring. Using a medium cookie scoop, drop cookie dough onto parchment lined cookie sheet. Sprinkle the top of each ball of dough with sanding sugar. Bake at 350 degrees for 10-12 minutes or until just set. TIP: Want to make your Strawberry Sugar Cookies look like they came straight from a bakery? After you remove your cookies from the oven, top with additional sanding sugar to get into all of the nooks and crannies. 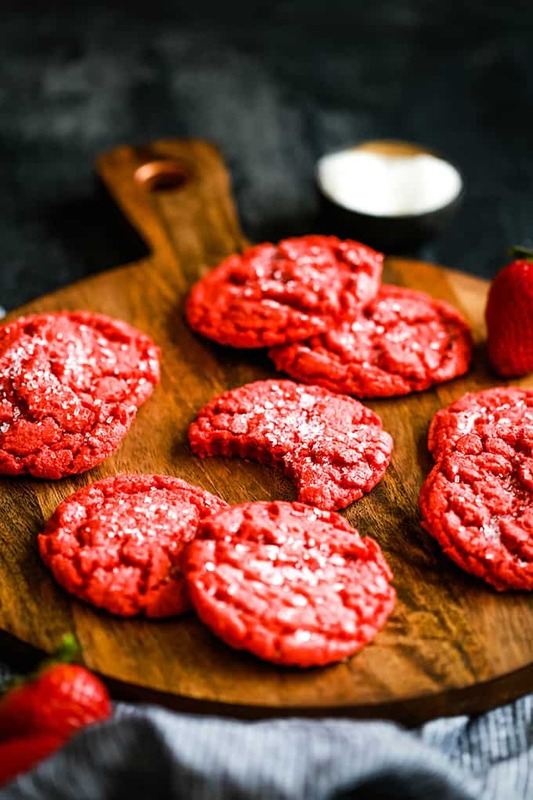 If you’ve tried these Strawberry Sugar Cookies or any other recipe on Melanie Makes, please let me know your thoughts in the comments below. I love hearing from you and respond to each and every comment! These Strawberry Sugar Cookies are simple and delicious and yield scrumptious, buttery cookies with crinkly tops, crisp edges, soft centers and (best of all) a burst of fresh, sweet strawberry flavor. Bake for 10-12 minutes or until just set. Allow to cool 2-3 minutes on baking sheet before transferring to a cooling rack to cool completely. This recipe was originally posted as a guest post by The Sucre Farine however I have since revised it to make it my own. 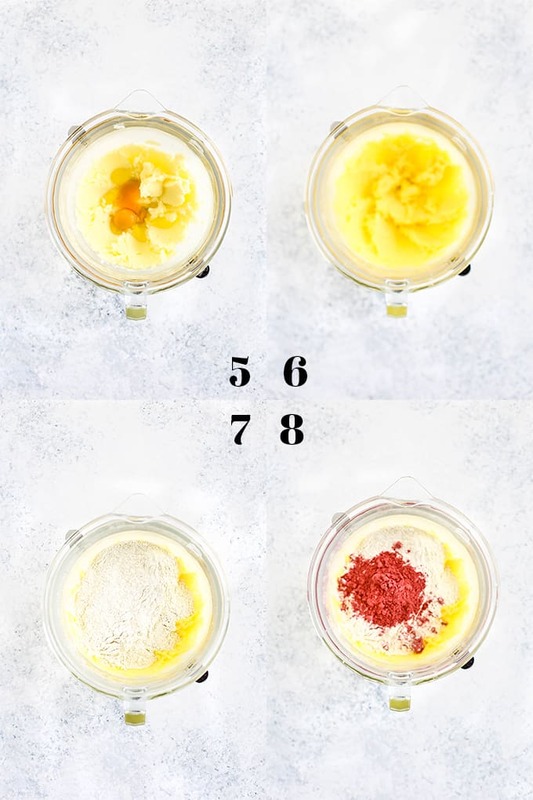 TIP: I prefer to use gel food coloring when baking as it's a higher concentration which means you have to use less of it than you would a traditional liquid food coloring. TIP: If you aren't able to find strawberry powder locally, I was able to purchase it online. In a pinch, you could also simply purchase a package of freeze-dried strawberries and pop them into the bowl of a food processor to pulverize them into a powder. Looking for other strawberry desserts? I can’t wait to try this pretty Strawberry Shortcake Cake Roll, super easy Strawberry Dream Dessert and incredibly moist 7up Sheet Cake with Strawberry Buttercream Frosting. 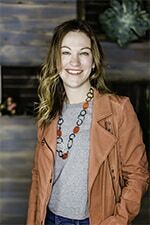 So thrilled you tried them and loved them, Heather! Hope you guys had a great Valentine's Day! Hi, Roxanne - I haven't tested the recipe using it but it just might work! How pretty are these? Perfect for Valentine's Day too! Can 1175 calories be correct? Hi! 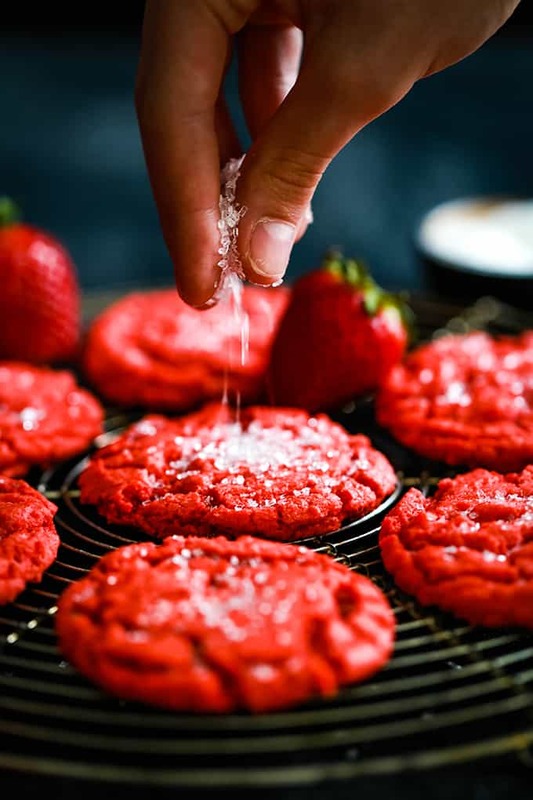 I want to make strawberry sugar cookies cause I have a ton of strawberry extract (and a few strawberries) left over after baking this past weekend. I was wondering if instead of the powder, could I use the leftover strawberry extract; would I use as much as the suggested vanilla extract? Hi, Tayler - I haven't tried this recipe with either but you could definitely substitute the vanilla for the strawberry extract using the same amount as a starting point. I made these and had to play around with the recipe to taste the "strawberry" flavor. The first batch, I followed the recipe using 2 1/2 tablespoons of strawberry fruit powder and it tasted and looked like a vanilla sugar cookie, not pink at all. I made a second batch and used 5 tablespoons which definitely tasted like a berry of some sort, but not easily identified as strawberry. While the dough looked very pink, once cooked they took on a light taupe color. I'm a graphic designer and was wondering if the photo was color corrected? An earlier post asked when to use the decorative sugar sprinkles which was never answered. 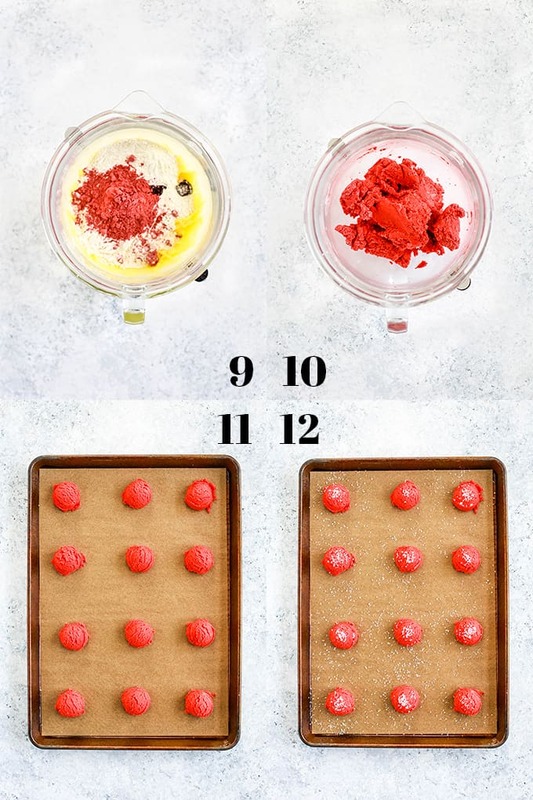 Roll your cookies into your sprinkles prior to baking. I bought Wilton Sprinkles, White Sparkling Sugar - 8 oz jar from Michaels and they worked out beautifully. I also used a 2" scoop and cooked for nine minutes. 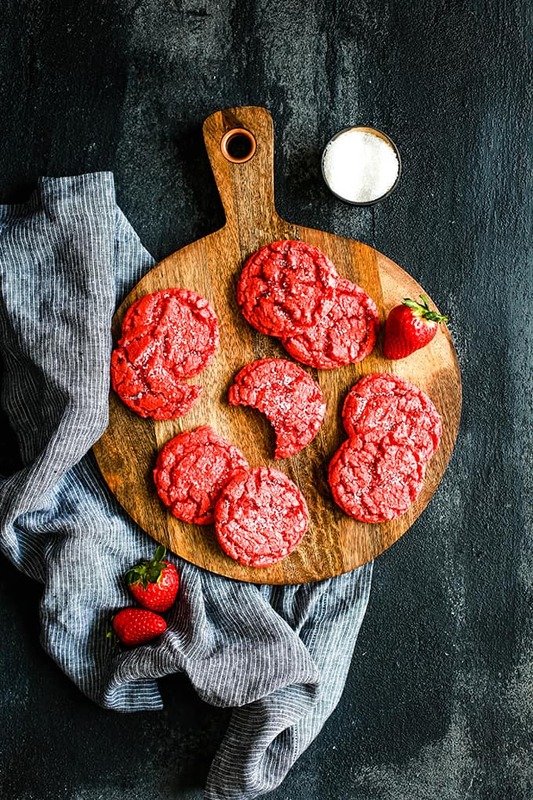 Next time I make these, I am going to try a drop or two of red food coloring along with the strawberry fruit powder to see if that helps the color. These sound wonderful, I was wondering if they would work as cutouts? Will this dough hold up well to being rolled out? I wanted to make hearts for Valentine's and was curious if I should hand shape them or if you thought it would be okay to roll out the dough? Hi, Meredith - I haven't tried this recipe with cutouts so can't say for sure. If you do give it a try, would love to hear your results! They turned out great! I would definitely do it again. I refrigerated the dough for about 20 minutes before rolling it out since it was a bit too soft to roll out otherwise. Thanks so much for taking the time to let me know, Meredith! Hi Meredith,I made these this past weekend and the dough is too moist to use cookie cutters. Thanks for taking the time to comment, Leslie! 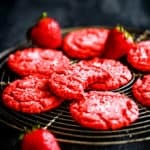 Hello, I've been looking for strawberry cookies recipe and and came across this. Sadly, I live in the Philippines and we don't have strawberry fruit powder. What else can I substitute with that to give the strawberry flavor..? Thank you! Hi, Christine - You should be able to order the strawberry fruit powder easily online. Unfortunately, I haven't tested this recipe with any other ingredients so I'm not able to recommend another product. In the directions you left out the part where you dip the cookie dough in the sandling sugar before baking. I made my own strawberry powder...got a bag of organic dehydrated strawberries and ground them up. Maybe you could come up with another cookie recipe using the strawberry powder....something like banana, strawberry, chocolate chip cookies....or Neapolitan. I was excited to find this recipe and made this just now. I was careful to not over bake but my baked cookie was never as pink as yours look in the photo. Actually they didn't seem very pink before baked. I triple checked my ingredients amount and did everything perfect. Are yours as pink as your photo? Can I add more strawberry powder for more color and for more flavor? We love the taste of thr cookie just wished it looked pink. Hi Kim, that's how mine came out, not sure if it was the strawberry powder or what. You could definitely try adding more strawberry powder or even add a drizzle of pink icing to "pink" them up a bit. My son is in the Army stationed in Alaska and I was making a list of goodies to send him for Christmas. He loves strawberries so I'm very glad I found this recipe. I hope they travel well through the postal system....haha!Thanks for the recipe! Regina, a bit thank you to your son and your family for your service to our country. The fact that you're including these cookies to him totally made my week. I want to make these for a baby shower. In my experiment mode, I used the whole spice strawberry powder you recommend but they began to turn brown during mixing??? What did I do wrong? I ended up adding color to see if I could get the pink back and they just aren't as pretty. Help? Hi, Amanda! I'm not sure if Chris has used this powder for cake or not yet but I don't know why you couldn't! Such a great product for baking! Ugh can't wait to try this recipe! 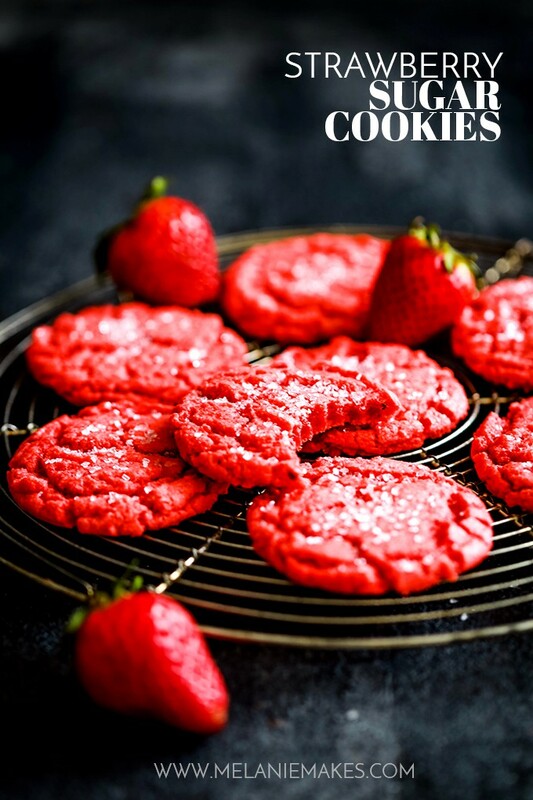 My mouth is literally watering looking at these strawberry sugar cookies of yours Chris! I'm a sucker for strawberry and this looks really deli! Maybe I can get my sister to assist me today to try them out or find a quick food delivery for this! Yummy looking recipe. Do you think that Strawberry Jello would work as a substitute for the Strawberry Fruit Powder? Hi, Laurie - I can't say for certain as I haven't tested the recipe using it. If you do, let me know your results! So glad that you enjoyed them, Nicole - thank you for taking the time to comment! Excited to try your recipe! Thanks so much for sharing. My question: when do you add the sanding sugar? before or after baking? I've done it both ways and for some reason I don't get as pretty results as those in your pics. I just made the strawberry cookies and they were not pink like yours. I baked exactly 10 minutes and I bought the strawberry powder off-line. They taste delicious and the strawberry flavor is there just not the beautiful pink color. Chris & Melanie - these are phenomenal!!! I was half expecting food coloring - I was not expecting strawberry Fruit Powder! Good to see Amazon has it because I have that window open right now! Not having made sugar cookies before, I am curious to learn at what point in the process the sanding sugar is added to the tops of the cookies..I enjoy your blog. Your discussions are cheerful and uplifting, and the photos make my mouth water! Thank you! Yes I just made these for thr first time today and there is no mention when to add the turbine do sugar. I did sprinkle some on top before they went into the oven. Hi, Kim - Let me see if I can get Chris to answer your questions directly! Hang tight! Congratulations Melanie and thanks so much for inviting Chris here to share these beautiful cookies. I agree that baking with strawberries is a challenge and I'm so happy to know about the strawberry powder. Chris your recommendations are always great as are your lovely recipes! One of your best ever Posts, Chris. These cookies not only look delicious but do have a gorgeous pink tint. Leave it to you to do the research to find the "right stuff" to make that happen. This could become a favorite cookie to make as I return to Aspen and another month (or, two) of Winter. You and Scott have put together your talents and turned them into the best retirement passion possible, I think. Finding a passion and running with it is the key to growing older successfully, I believe. What I really envy is Scott's ability to edit your copy. Every writer needs an editor and that's what I'm lacking. These are lovely and really easy to make. I've some strawberry fans in my home who will be thrilled about this. Thanks and congratulations on your new addition to the family. Enjoy your time with her as they grow up so fast :).